The goal of sonic treatment for movies and television is, in a way, to convince you that it doesn’t exist. Sure, we all have our favourite movie themes firmly implanted in our memories, but part of our appreciation for such music resides in the fact that it doesn’t get in the way of the story – it compliments the action, in some way strengthening our emotional connection with the scene. All the other sounds are designed to maintain the suspension of disbelief essential in conveying the plot to the audience. When this is done successfully, the audience can inhabit the world created by the story. And as such, the sonic elements that bring such a world into existence are meticulously curated and executed with precision. In this article, I’ll focus on a few of the basic roles that sounds engineers fill and some of the techniques they use to bring audio to life on the screen. What you hear on film is not always what you might imagine it might be. We take a look at the shadowy art of sound engineering for the pictures. Just like tracking a band, getting it right at the source is critical. Though much of the sound for film and television is recorded after the filming stage, there are a couple of important reasons, both practical and artistic, for the capturing of sound on location. The communication between characters is integral to any story. Like the ambience recording, it may suit the dramatic arc to include on location dialog. More often than not, however, this isn’t case. The raw audio from dialog recording can be compromised by the extraneous ambient sounds and therefore unable to be used in the final mix. Beyond the on-location phase of recording, post production is where the bulk of audio is curated for a film project. Capturing sounds in a dedicated recording studio that is speedy and efficient enough to meet tight deadlines is essential for the incorporation of uncontaminated audio for the final mixdown. Also known as “dubbing”, this stage of the audio production is completed in a studio in the post production phase. This is in a similar realm to voice over. As you can imagine, recalling the emotional terrain of the initial performance is a great challenge for the actors involved, so ADR is usually recorded with the aid of the original footage. “Looping” is another key term associated with this process. The original footage of the on screen dialog is looped for the actor to record their new dialog. 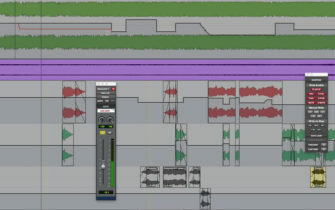 As the footage continues to be looped, the goal for the actor is to precisely match the timing and rhythm of the filmed dialog, in order to make the syncing of picture and sound as smooth as possible (incidentally, the loop record function in Pro Tools makes this task very efficient – simply have the actor perform the slice of dialog in sync with a loop of the recorded footage and takes will be stored for convenient comping). Similar in technique to ADR, “Foley recording” is the synchronising of customised sound effects to the action on screen. Though many sound effects can be efficiently recorded on location, the re-recording of these ambient sounds is essential for the creation of a coherent and authentic sonic palette for any given scene. Foley has a reputation for being one of the most creative and eccentric components soundtrack creation. A massive variety of materials needs to be used judiciously in the art of Foley to create a sense of believability in the incidental sounds in a scene. And though the recording of these sounds involves conventional methods, the studios need to accommodate a range of unique materials like water, sand, foodstuff to different types of flooring mention but a few – it can get messy! It’s important to shed light on these recording techniques. The audio world is a broad spectrum and it’s interesting to remember that sound can be designed to disappear into the background in service of the greater good. This doesn’t make the art any less deliberate or considered though. It’s created to be incidental, but it’s still created.